Learn more about Google+ settings in the Help Center. Google+ communities and collections help people connect around the things they’re interested in. 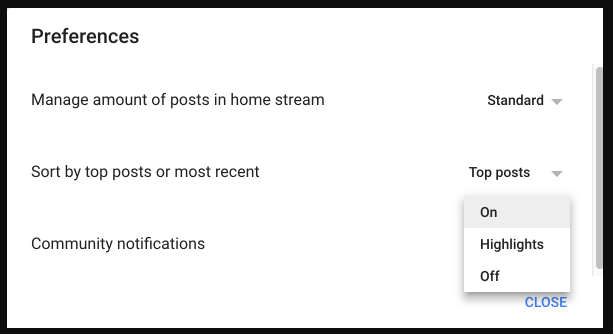 To help you stay on top of these connections, we're adding more options for how often you're notified about new posts in the Google+ communities and collections to which you subscribe. Instead of getting all or no notifications, you can now opt to get "highlights" only. When the highlights option is selected, we will send you a digest notification of the top posts from across all of your G+ communities and collections. This will help save you time and ensure you’re seeing the posts that matter most.